How I Gained It: The best way to describe my weight gain is gradual. All throughout junior high and the beginning of high school, I was a tooth pick. I ate everything in sight, none of it healthy, but never gained weight. I was told by everyone around me that some day my metabolism was going to slow down and I couldn't eat like this forever. At the time I didn't care! I enjoyed eating anything and everything and having no consequences. In high school, I would eat a grilled cheese sandwich with fries, two chocolate milks, a slice or two of pizza and maybe some ice cream for dessert. This was a daily routine. When I turned 16 and started driving, I had access to even more fast food. I also got a job at a fast food restaurant. Suddenly, the moment everyone told me would happen, happened. I began packing on weight. As a freshman in high school, I was around 160 pounds. By the time I finished high school, I was 225. Some of this was normal weight gain as I had also grown a bit, but most of it was unhealthy weight gain. When I graduated high school, I moved away to school at the University of North Dakota. My mom told me to take it easy at the dining halls; the food there is never good for you. Boy, she wasn't kidding. Pizza, ice cream, chocolate, chicken tenders. All my favorite foods were available to me in unlimited quantities. Of course the typical college drinking scene didn't help. Most of the jobs I held throughout college were sitting around at a desk, requiring no walking around at all. The thought of a gym scared me. Before I knew it, I was approaching 300 pounds. I was unhappy, depressed and scared. Breaking Point: My breaking point was a series of events that occurred around Christmas 2011. I drove home from North Dakota to Illinois for my Christmas break. My grandparents live in Minnesota, about the halfway point between school and home, so I always stayed with them for the night to visit. My grandma was always supportive of me whenever I visited, and we talked about good ways to lose weight. Like me, she had been struggling for a while to lose weight, and she understood how difficult it was to even want to lose the weight. She gave me a hug and said if I put my mind to it, I could lose as much weight as I wanted. She fixed me a meal with a nice healthy salad, and I went on my way. I had six and a half hours to think about what she said before I arrived home. Maybe I was ready to lose the weight. I told myself I would never in a million years reach 300 pounds. But here I was at 293 pounds, only seven away from the nightmare target. It had been several months since my mom had seen me, and when I walked in the door, the look on her face said it all. She couldn't believe how big I was. She sat me down a couple days later and said, "Brian, I'm worried about you." This made me sad, upset and angry. I knew this was just a defense mechanism, trying to defend my weight. This was strike two. Strike three was Christmas Day at my grandparents' house. My uncles and cousins are, well, blunt, to put it lightly. We're a very sarcastic family and sometimes we don't take into consideration others' feelings. That day, I was the target of the jokes. My uncle's reaction said it all when I walked in the door. "Whoa," he said. I know this was an involuntary reaction, but it really hurt. He truly was surprised. He wasn't trying to hurt my feelings, but I got the same reaction from everyone that night. This was when I realized I had reached rock bottom, and it was time to change. How I Lost It: After Christmas, I talked with my mom about some good ways to lose weight. I was terrified. After all, food was my crutch. It was there for me when I was tired, scared, sad, mad, you name it. I realized it was an addiction. She recommended Weight Watchers. I'd heard of it and had seen the commercials, but wasn't sure how it worked, so I looked it up and thought it looked very promising. What made me optimistic was the fact that it was not a diet. I'd tried diets in the past. They work, but only temporarily. I signed up for Weight Watchers that day. I believe the day was January 4. I chose to do the online tracking vs. the face-to-face meetings. My school and work schedule just made it too hard to fit more meetings into my schedule. When I arrived back at school in North Dakota, I threw away all the junk food that was in my apartment. My roommate was extremely supportive, but I think he thought it was just going to be another fad diet like I'd tried in the past. I began tracking my food religiously. I tried to eat food rich in protein and low in fat and sugar. I started out slowly, as Weight Watchers gives you a big allocation of points to eat and slowly takes points away. By the end of January, I'd lost almost 10 pounds. I couldn't believe it! It wasn't even that hard. I'll admit there were times where I was really hungry, but all my points were gone. I stayed strong and ate some fruits and vegetables, which are free under the Weight Watchers plan. By May I'd lost 45 pounds. I felt better, but I still looked in the mirror and saw a fat kid. People were always asking, "Wow, have you lost weight?" It felt good to know that people noticed, but I still didn't notice. I graduated college in May 2012, and moved back home. I got a relatively physical job and stayed active by walking three to five miles at least three times a week with a friend. I reached the 50-pounds benchmark at the end of May. What a great feeling, but I knew I was only halfway there. 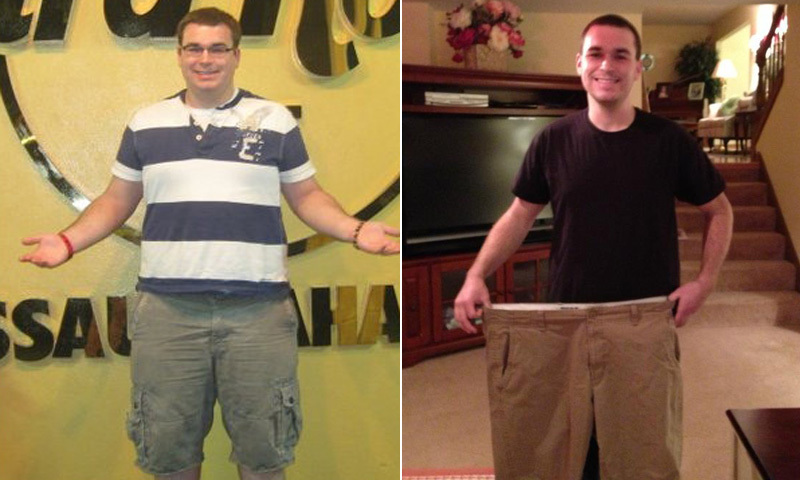 My target when I first started was 200 pounds, but I realized I could do better. I wanted to reach 180, which was considered normal for my age and height. I continued doing Weight Watchers throughout the summer, and soon realized it had taught me all that I needed to know. My appetite had decreased significantly, and I was eating healthier than I ever had. Even better, I was eating less and still feeling full. I reached 200 pounds in October and felt fantastic. I finally saw the progress. I had lost almost 100 pounds before I saw my own progress. People were constantly congratulating me and cheering me on. The feelings of encouragement kept me going. I'll never forget the day I stepped on the scale and it read 193. It was December 3, 2012, less than one year since I'd started my weight loss journey. People were high-fiving me, hugging me and offering words of praise and encouragement. Most of all, I couldn't believe I'd done it. Less than a year ago, food was all I thought about. Now I can control my cravings and eat sweets and junk food in moderation and only on occasion. I eat healthy and treat myself once or twice a week. I run on the treadmill at least three times a week and have recently started lifting weights. Today, I weigh 182 pounds. I no longer snore, my self-esteem is back to where it was six years ago, I no longer feel depressed, and to be honest, I feel on top of the world. My health has improved dramatically. Being overweight robbed me of enjoying the little things in life. I didn't have the true college experience because I was too self-conscious to go out and have fun. I finally look in the mirror and see a healthy 22 year old. I'm a few pounds from my goal and have no plans to return to the past Brian.